Just across the Adriatic Sea from Italy, tucked away between the former Yugoslavian states of Bosnia and Herzegovina and Serbia, as well as Hungary and Slovenia, Croatia is almost easy to miss on the grand scale of a European map. But as the home of kind and generous people, a fascinating history, intriguing cultural traditions and a beautiful coastline, the country is well worth a visit! LG section editor Candace Rardon recently spent a week in the Croatian city of Zadar and offers everything you’ll need to make the most of your time there. If you’re already planning a trip to Europe sometime soon, Zadar could be a perfect stop to add to your itinerary. It’s easily reached from London via budget airlines like RyanAir and GermanWings, as well as Croatia Airlines, and Slovakian airline Danube Wings also offer flights from Bratislava and Austrian airline InterSky flies from Friedrichshafen, Germany. 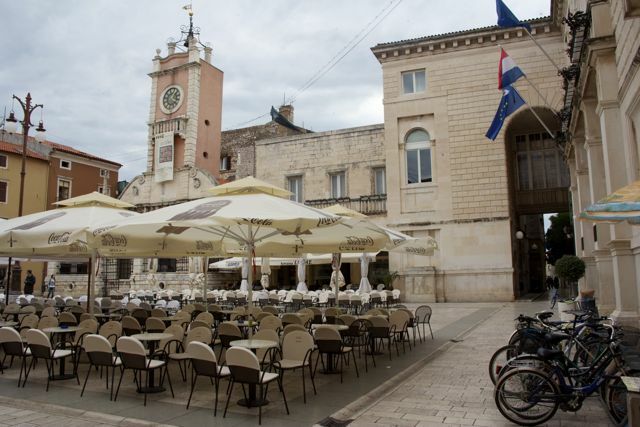 Alternatively, if you’ll already be elsewhere in Croatia, whether it’s up north in the capital of Zagreb or down south along the Dalmation Coast of Dubrovnik, Zadar is easily reached by express coach and train. 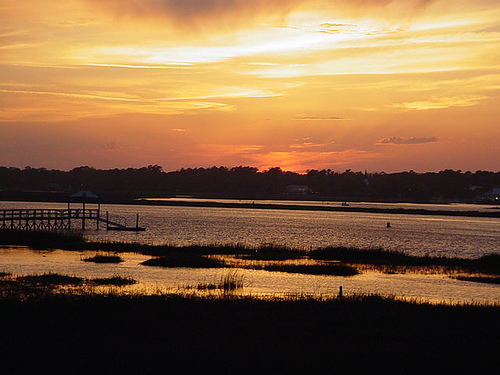 There are several websites that can help you sort out departure and arrival times. With a population of only 72,000 and an old town that can be walked from one to the other in about ten minutes, getting around the heart of Zadar itself can happen mostly on foot. There is a public bus service to and from the airport which costs only 25 Croatian kuna–or about five US dollars. Although the bus doesn’t run often, it’s very much coordinated with the international flight schedule and is a great way to avoid taking a taxi. If you’re like me and are keen to stick to a budget, there are plenty of low-cost accommodation options available. 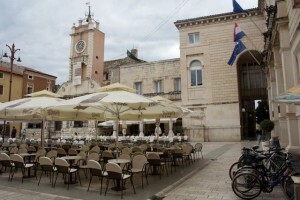 I chose the Old Town Hostel right in the center of Zadar’s historic area and it couldn’t have been in a better location. It’s no more than a ten-minute walk from the bus stop and is literally steps away from the outdoor cafes of the main square, Narodni Trg. One night in a 4 or 8-bed dorm was about $20 a night, but they do offer twin and double bed private rooms as well. Although the country is currently in a thick debate over whether or not to join the EU, Croatia is still independent and retains the Kuna as their official currency. One US dollar is equivalent to about 5.2 kuna, while one Euro is 7.5 and a British pound is 8.5. Rather than hunt down a currency exchange office in London that carried the Croatian currency, I simply brought Euros with me and changed them once I’d arrived in Zadar. The bus driver from the airport and my hostel both accepted Euros as a form of payment, and I even found a restaurant my first night that took them as well…although my change was in kuna! A small currency exchange is located just off the main square, on a street named Elizabete Kotromanic, and can then change your Euros for you. It won’t take you long to notice the rich Italian influence on the city–and I’m not just talking about the 16th century city walls built by the Venetians or the ruins of a Roman forum that date to the 1st century BC. 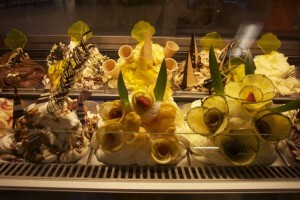 Zadar’s old town is filled with pizzerias and gelaterias, enough to make any Italophile’s heart warm. Many of the main streets are lined with places where you can get a huge slice of pizza–or “pizza cut,” as they refer to it–for just 10 kuna, followed by a tasty scoop of gelato for just 6 kuna. These streetside cafes usually feature outdoor seating, which makes for not only a great place to rest your feet, but to people-watch as well. Some of my favorite pizza joints were located along Stomorica, which isn’t far from bars like Havana Club and the Lotus. The old town of Zadar is located nicely on a walled peninsula that juts into the Adriatic. Despite its small size, this promontory holds a number of cathedrals and churches well worth peeking your head into, as well as an archaeological museum that goes into more detail about the Roman presence in Zadar over the centuries. If you’re hoping for a bird’s eye view of the city, spend part of a morning climbing nearly 170 stairs to the top of the Church of Saint Donat’s belltower. A ticket costs only 10 kuna and will give you an unbeatable panoramic look over a sea of terracotta roofs and cobblestoned backstreets, not to mention crazy windblown hair. It was Hitchcock who once said, “Zadar has the most beautiful sunset in the world,” so be sure to catch one for yourself. The best place to do so is from the steps of the Sea Organ, a man-made attraction near the northwest corner of the promenade. Built in 2005, the white marble steps are built on top of pipes that produce an eerie melancholy tune when the waves push into them. Just next to the steps is a 22-meter circular installation on the sidewalk called the Greeting to the Sun. Composed of a series of solar panels, it spends the day soaking up energy from the sun, only to light up in rhythm to the waves at night. 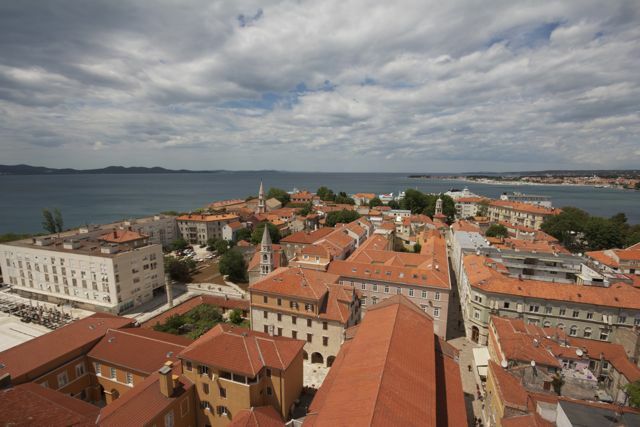 Zadar is the kind of city that seems purpose-built for daytrips. With a small old town that can be seen in just a day or two, Zadar makes for a perfect place to base yourself and take advantage of the extensive archipelago off its coast. The Kornati Islands are a main attraction–several tour operators compete in offering daytrips for around 270 kuna–however, if you’re looking to not only save money, but also for something off the beaten path, consider exploring other islands instead. 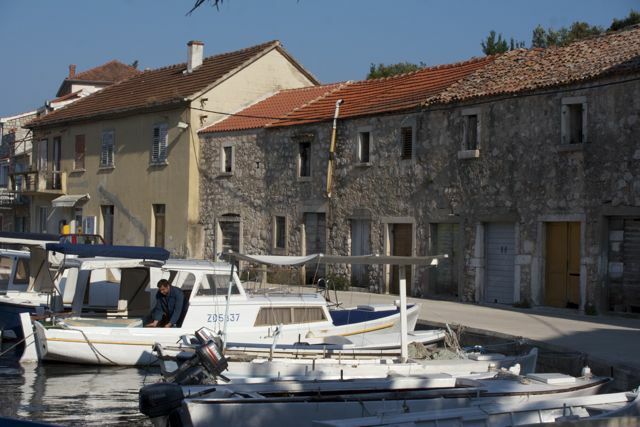 Because of its proximity to the water, Zadar has an excellent, and not to mention affordable, ferry system that will soon have you out and about the Adriatic. While Jadrolinija is the public ferry company, several private companies offer catamarans and ferries to the islands as well–and usually for the same price. During my stay, I had a chance to visit three islands. 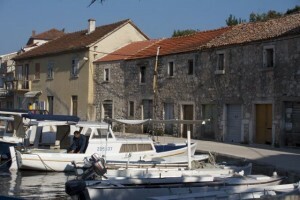 With a return ticket for just 36 kuna, the first was Dugi Otok, which literally means the “long island” in Croatian. Once we arrived, I rented a bicycle for 80 kuna from a local cafe–“the cafe with the orange chairs,” as the island’s tourist office advised–and set out with a map in hand. Be warned: the island is not known for its flat terrain. Although I lost count of how many times I had to get off and push my bike up-hill, making it to Telascica National Park was worth it. 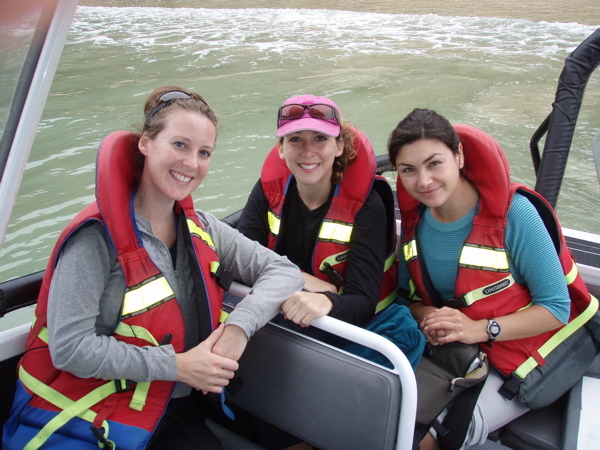 The next day, I boarded a catamaran that cost 20 kuna each way and explored the island of Iz. While it only has two villages, Mali Iz and Veli Iz, they are within one hour’s walking distance of each other and feature beautiful rocky coastlines, aquamarine harbours, and marinas filled with sailboats. My last daytrip didn’t involve a ferry, but a bus I caught at the main terminal about fifteen minutes from Old Town. Although my most expensive trip yet–a return ticket was 90 kuna–the island of Pag, with its barren lunar landscape, white stone old town and rich tradition of lace-making, isn’t one to be missed while in Zadar. OOOh! I love Zadar and the Sea Organ, especially on a breezy evening as the sun sets. So atmospheric! I am looking forward to visit Croatia. Thanx for your post. It is really helpful. Whatt a Blog Post!! Interesting! My travel Group loves traveling and exploring Zadar. It is surely an awosme place.